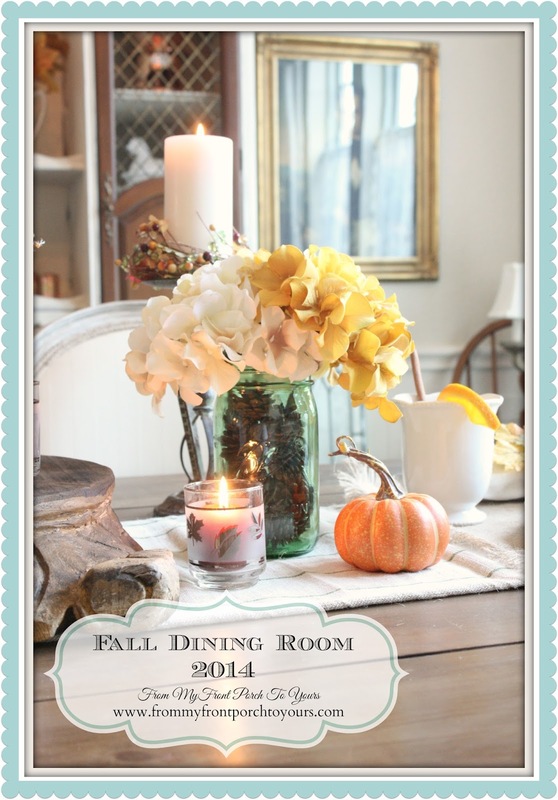 I was excited to decorate the dining room this year for fall with all the changes from the makeover. I took so many pictures that I almost thought about breaking this post up into two. I narrowed them down the best that I could though so I hope that you enjoy! 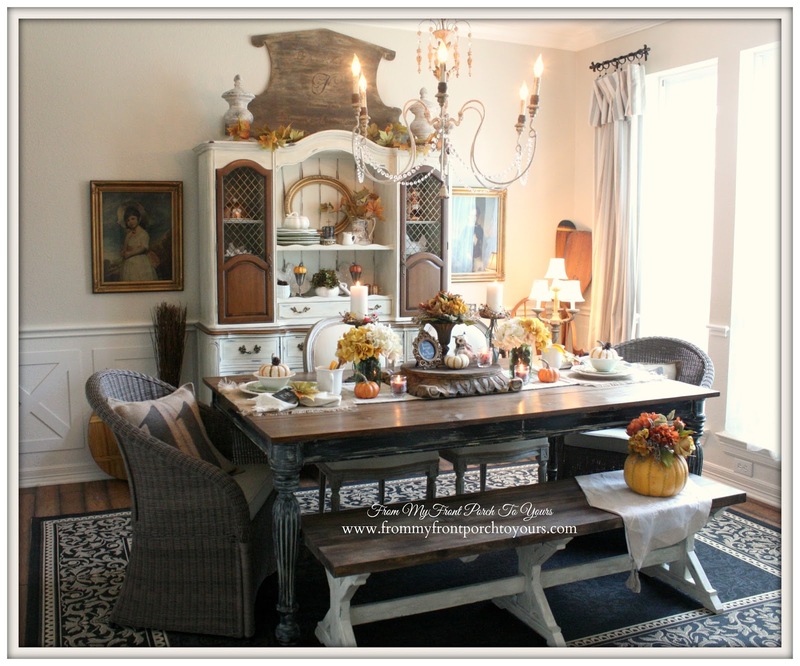 Welcome to our French Farmhouse dining room all dressed up for fall. 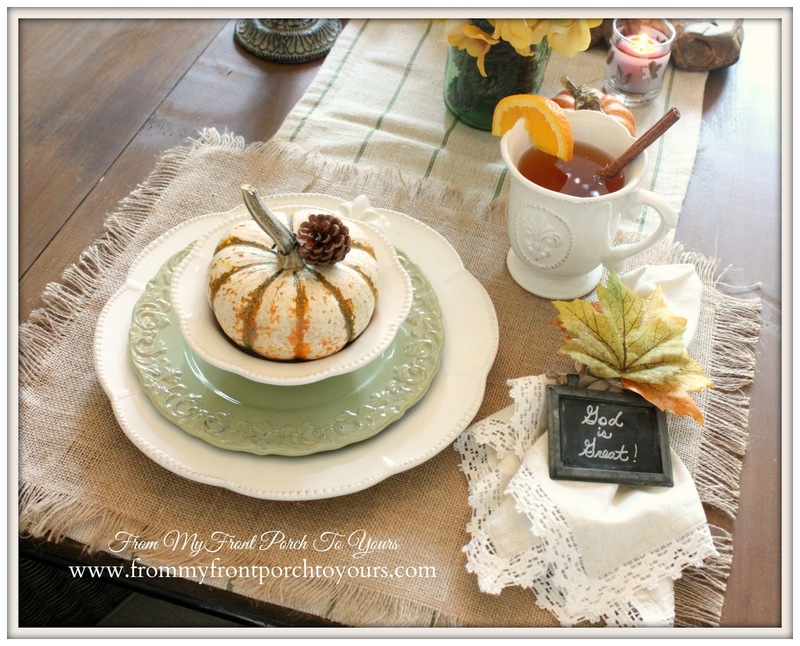 I hope to share the fall mantel next so be sure to stop back by! Absolutely Beautiful!!! Have a wonderful weekend Pamela! 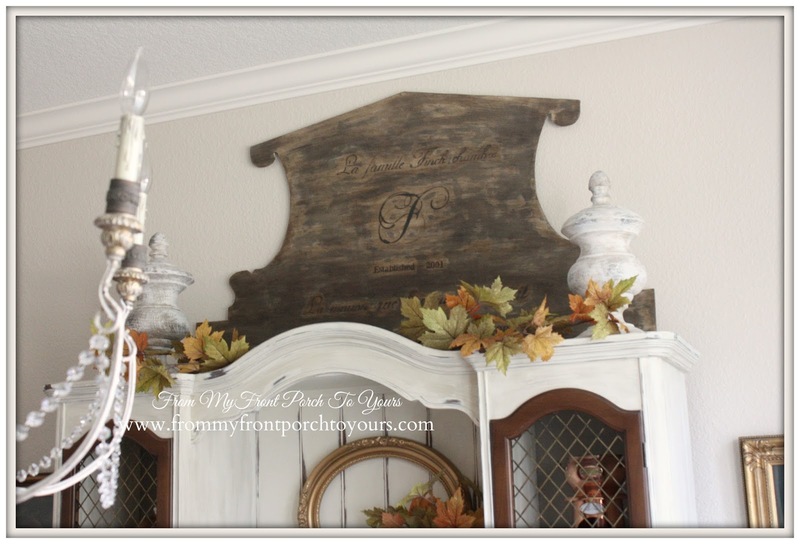 Your dining room looks awesome, Pamela! 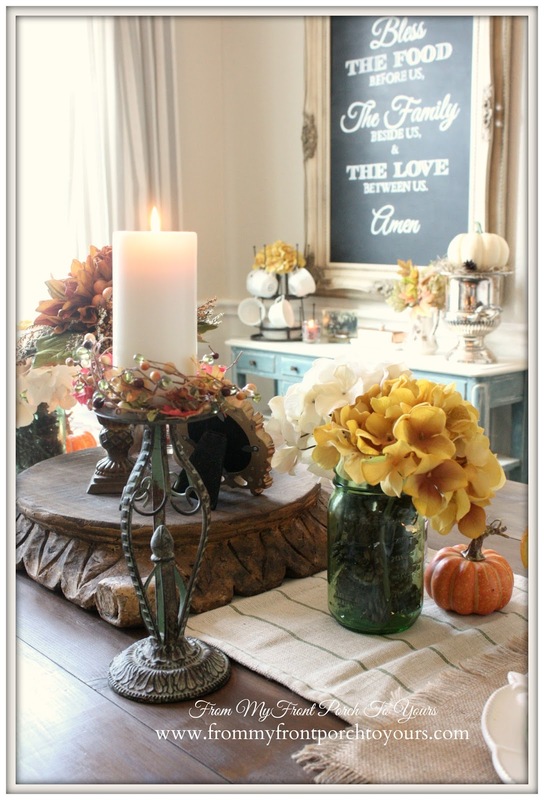 All of the fall details work so well in concert with each other to create such a warm and welcoming room...a place to linger after dinner. 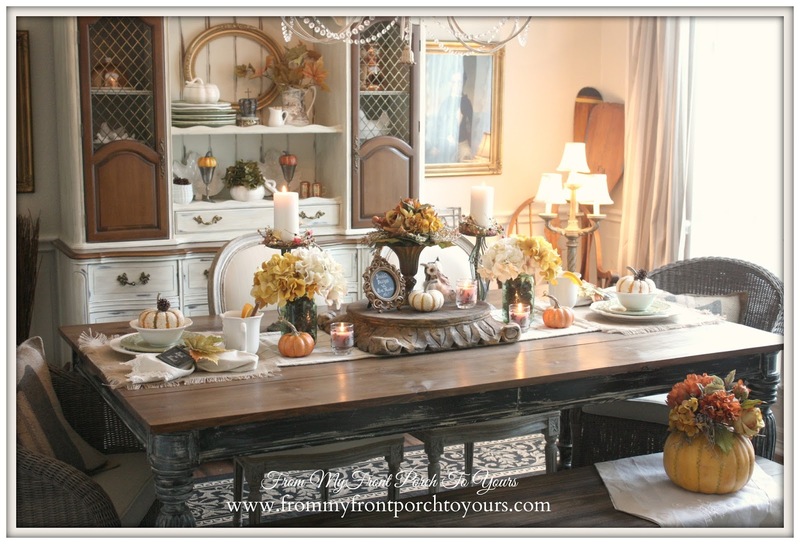 I love your dining room, so beautiful and I adore you tablescape. Stunning. it's gorgeous, Pamela! 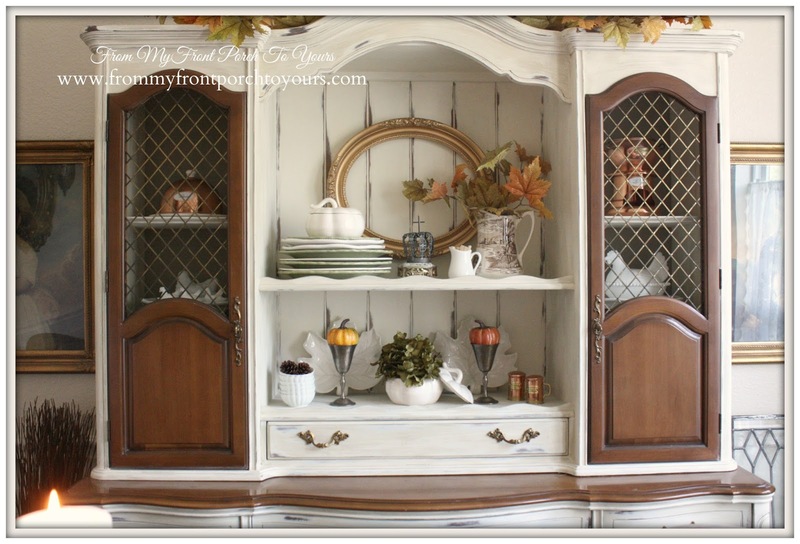 love that amazing chandy and your Fall Cupboard!! 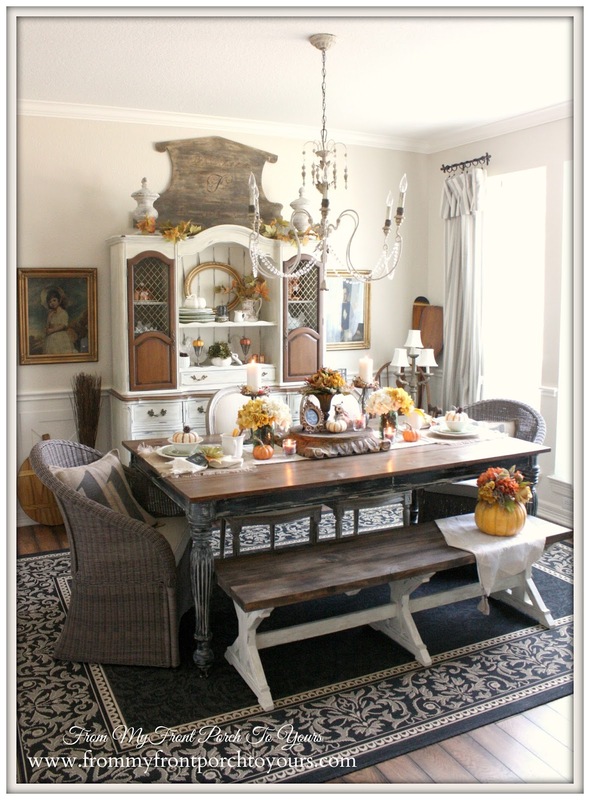 Love your dining room dressed up for Fall ! 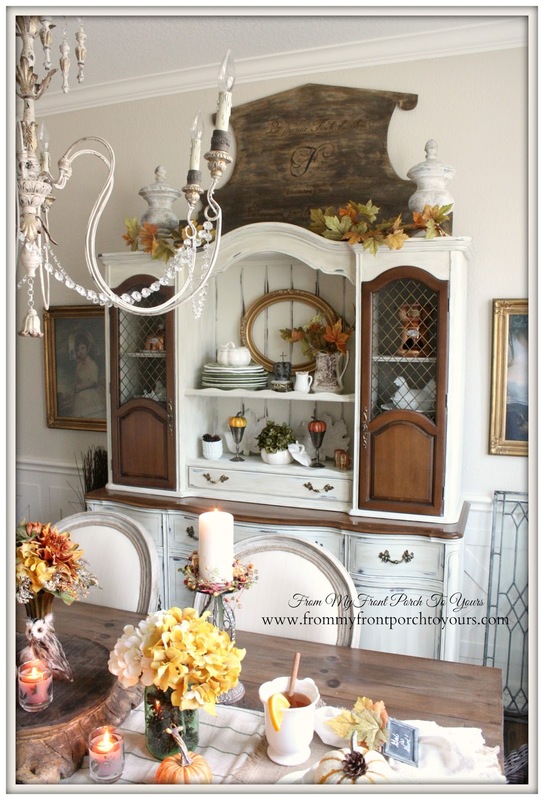 Your fall color pallet looks so rich and beautiful against your creamy dining room walls and exquisite wood and painted furniture, Pamela. It's so soft, and everything just glows. Gorgeous! 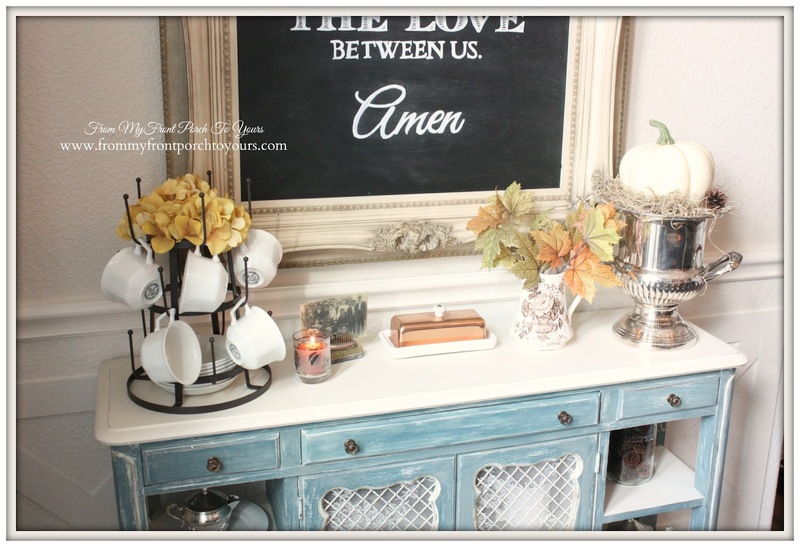 Your room looks grew Pamela and so ready for Fall! Love this room! The Fall touches are really nice! Just beautiful Pamela! All perfectly ready for Fall. 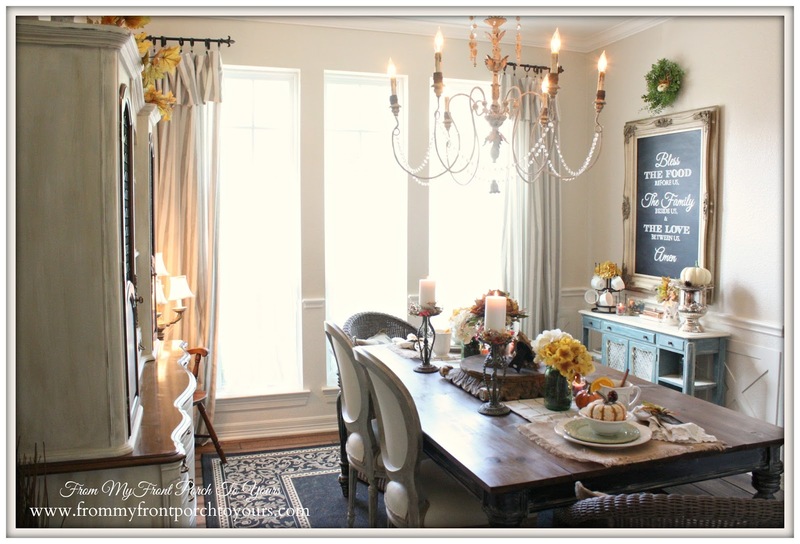 I love all of the changes you have made in your dining room. 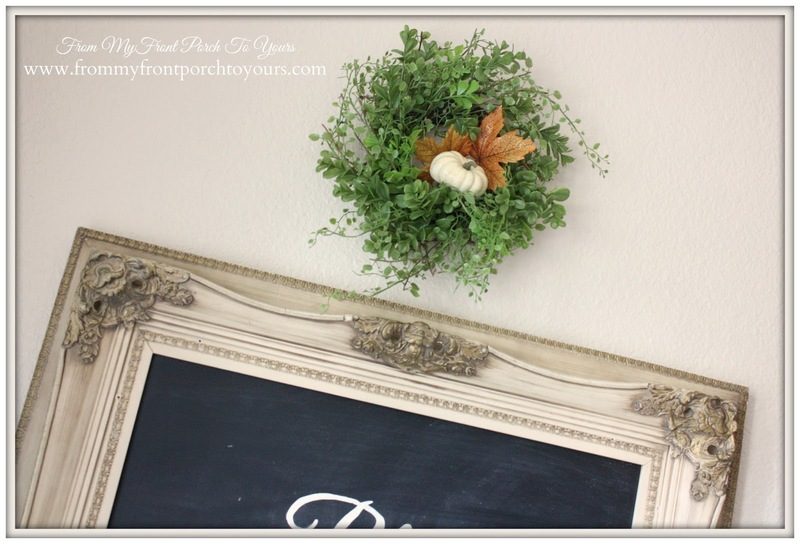 Your fall decorations are beautiful! 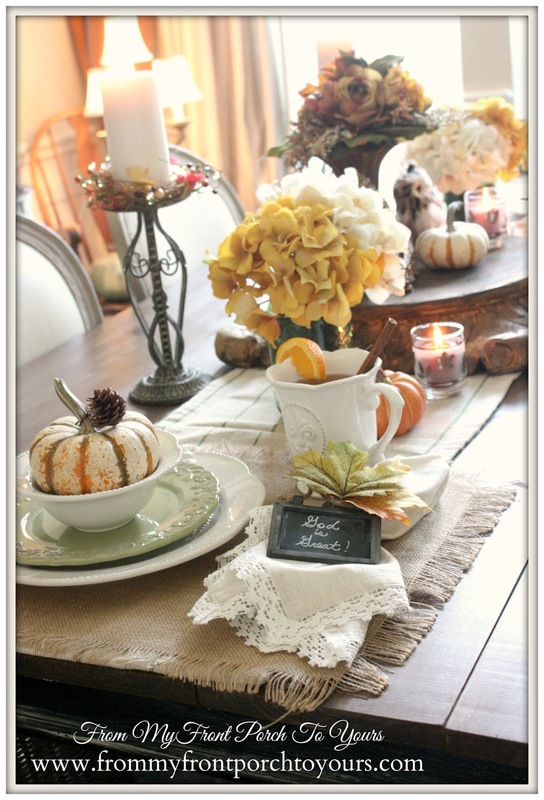 Your table scape is beautiful!! 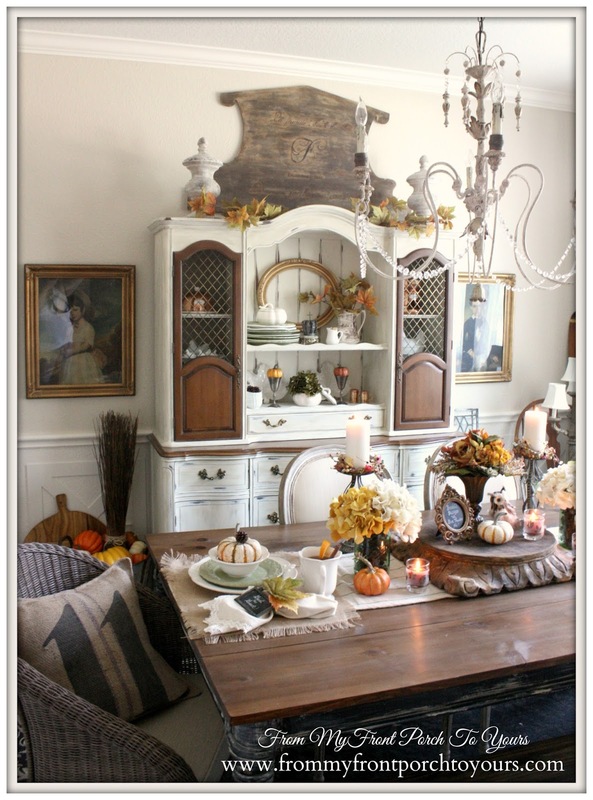 You have decorated your dining room so beautifully. Very pretty, Pamela! I love your chalkboard. 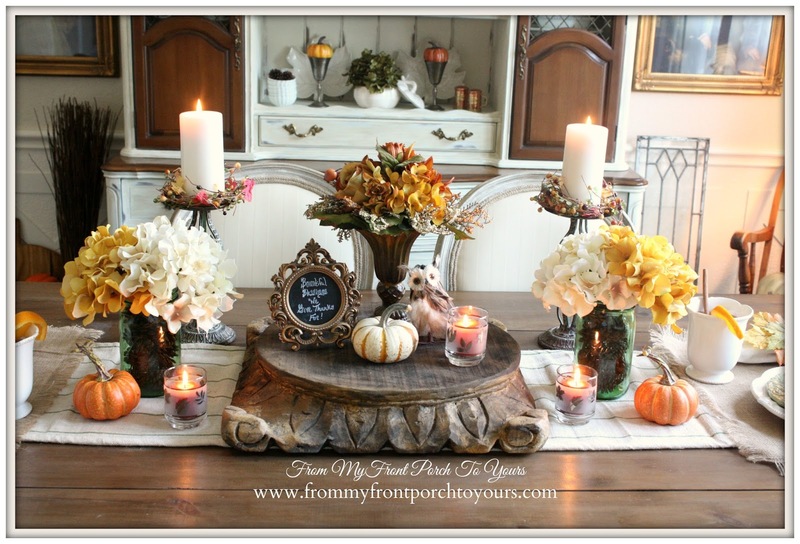 Your table looks like a harvest table should look in the Fall! I just love your style :) beautiful room! It's so pretty, Pamela! I think I'll drop by and have dinner with you if I'm ever in Texas! LOL! Have a great weekend! Beautiful- especially watching all the work you did in this room. Thought of you- finally found a Home Goods in Denver! Looks gorgeous, Pamela! Love the sentiment on the chalkboard too. 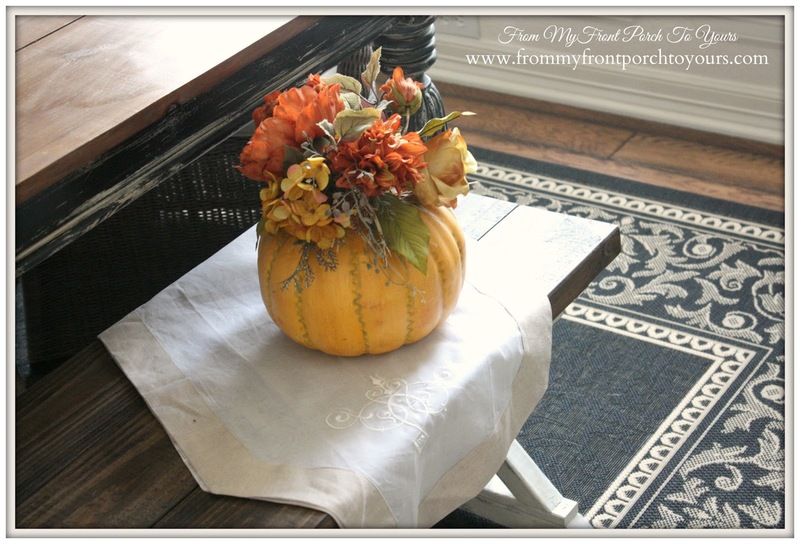 Beautiful Pamela... You did a great job bring Fall into your beautiful dining room! Hi Pam! I had been eyeing the ones at World Market for a few years now when they went down to like $70 a piece once. Never again did they and I ended up finding some vintage ones locally. They were a set of four. 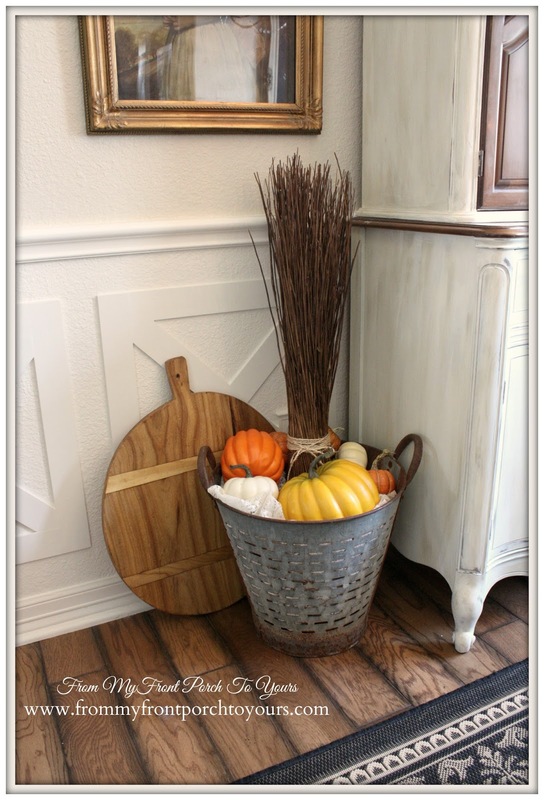 I have one in our kitchen I reupholstered and then the two in the dining room that I made over by painting the fabric with chalk paint to make them look like the ones at World Market. One lonely one still out in the garage! ;) If you to my Project Gallery page you can click on Link 21 to see how I made them over. It looks absolutely beautiful. All the little details just make it look perfect! Love it all, Pamela! 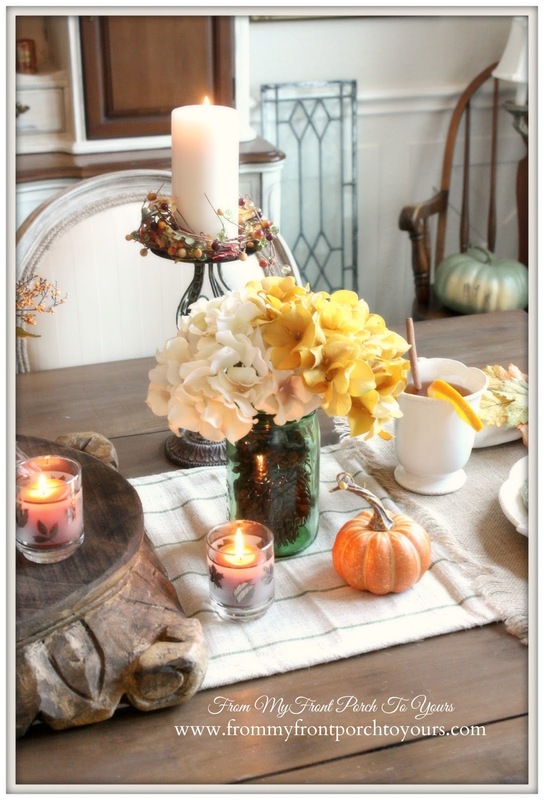 I like that you add touches of Fall everywhere and you decorate with lots of different elements…which I think brings it all together in a warm, welcoming way. It's lovely! 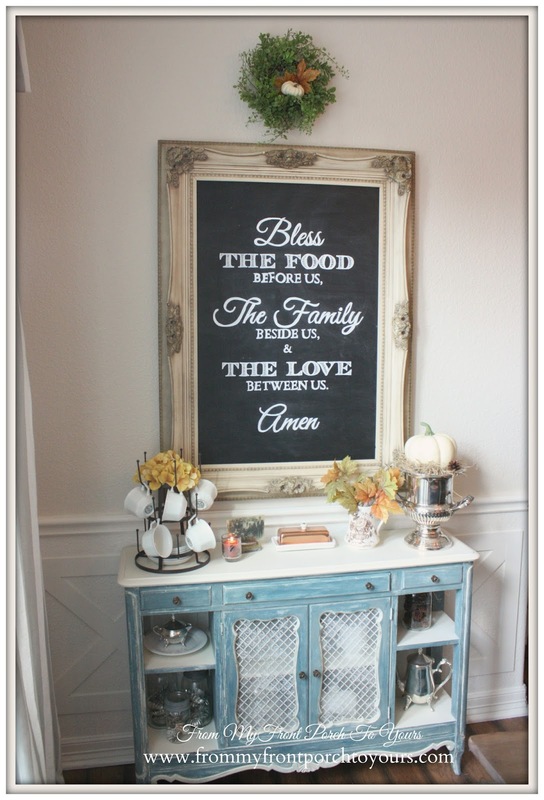 I also LOVE the board above the hutch! 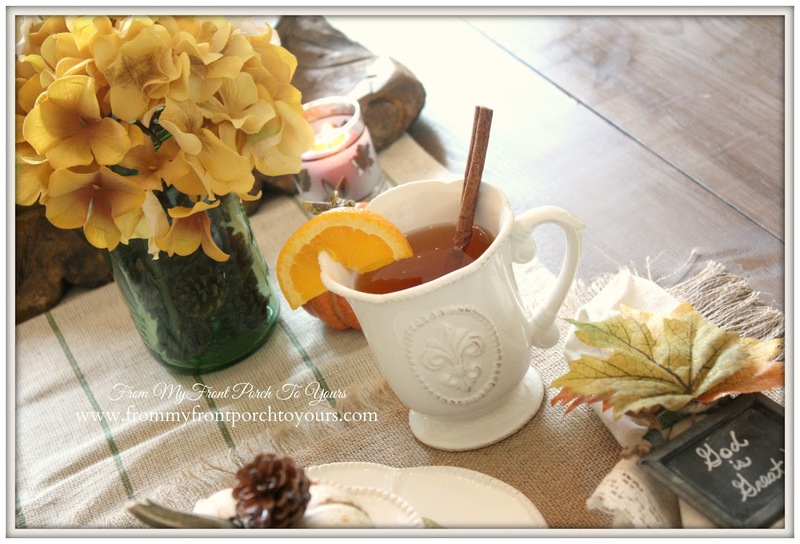 I haven't blogged in 2 months and I am so glad to be welcomed by lovely posts such as yours Pamela! 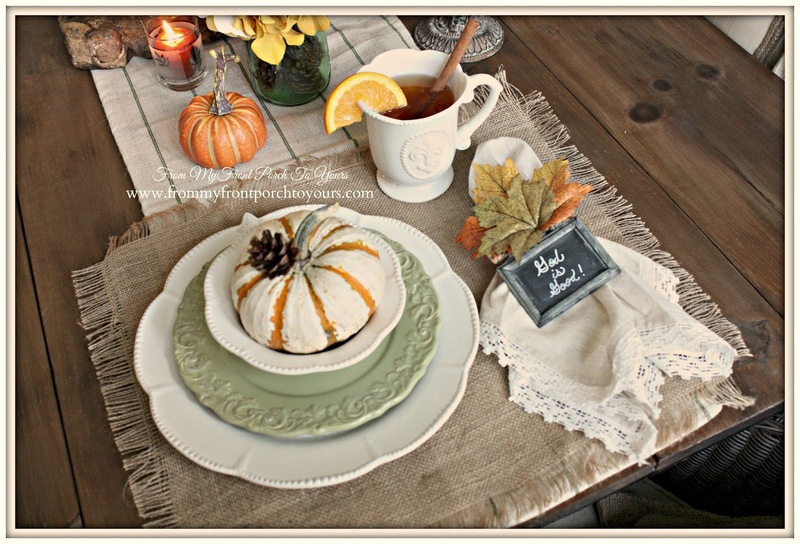 Fall-perfect!